I enjoyed reading this book. The author introduces us to the characters and events straight away which Is a sure fire way to get me into a book. The characters are all realistic and likeable and the setting is a wonderful brownstone in new York. I enjoyed the storyline even though there isn't too much substance to it. The main character is going through a break up and so takes in three lodgers, each of them bring with them their own personalities and issues and so the story is formed. There were tears of sadness and tears of joy shed on my part, and some of the issues tackled are fairly thought provoking, however I think that the plot should have gone deeper into some of these issues rather than go further along in time as it did. I am sure fans of the author will find plenty to enjoy and the books provides alight read for those looking to fill a space in their beech bag or briefcase, but if you're looking for a beefy story line, this won't satisfy your appetite. "There's a lid for every pot... You Just have to find yours. -Avery"
Despite being a lifelong romance lover? 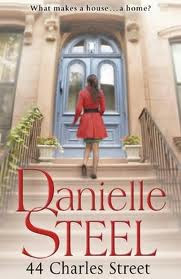 I have never read a Danielle Steele book! But you make this one sound so good, maybe I'll hunt out one! This sounds like a cute read, not to complicated but perfect for a Sunday afternoon. Great review!